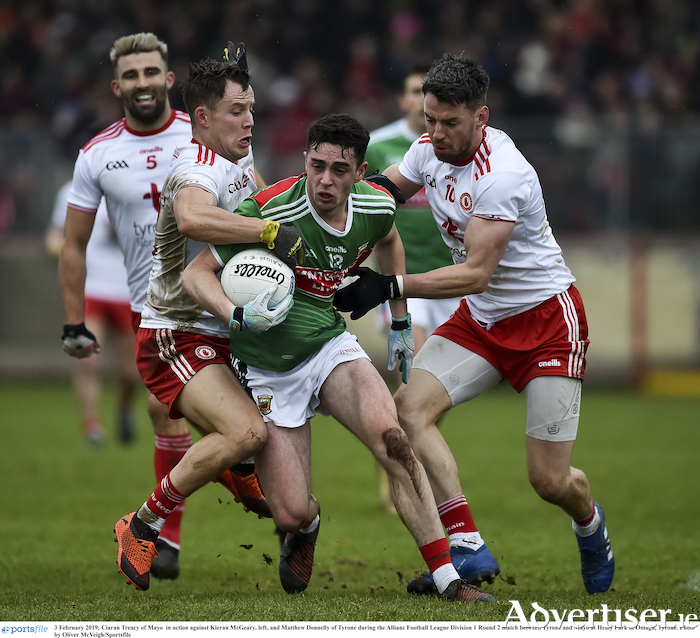 Mayo picked up their second win on the bounce in the National Football League on Sunday - with a display impressive performance against last years beaten All Ireland finalists. James Horan changed up his starting 15 from the one that edged out Roscommon the previous weekend - with the two most interesting changes in the side he named being starts for Fionn McDonagh and Ciaran Tracey in the wing forward positions and both men repaid the faith Horan showed in them in some style. McDonagh finished up the day with 1-3 to his name and Tracey with two points, as both young men took to the game with ease. Mayo did start the game sluggishly enough, with Tyrone hitting the first two points of the day - the first from Darren McCurry who slotted over a close range free which was followed by a converted mark from Lee Brennan in the fourth minute. Tyrone goalkeeper Niall Morgan joined into the play out the field for the first time on the seven minute mark and he got off a shot that was tipped out for a 45 - we’d see Morgan repeat this trick a few times over the course of the game and he was rewarded for it late on with a fine point from play. Mayo got the scoreboard ticking in their favour nine minutes in when Aidan O’Shea, Brian Reape and Donal Vaughan combined to set up McDonagh for his first score of the day nine minutes in. Three minutes later his fellow newcomer Tracey levelled it up with a slotting over fine score on the run after some good play in the build up. Peter Harte edged Tyrone back in front just after the 20 minute mark when the Mayo defence kept backing up - rather than going to confront the ball carrier and Harte made no mistake with his effort. But it was about to become all about Mayo who would go on to outscore their hosts by 1-5 to 0-0 before the half-time whistle. Tracey tied it up at three points each after Paddy Durcan had done brilliantly well to win the ball back and pick out Andy Moran who played the final pass to Tracey before the Ballina man stuck it over the bar. Andy Moran edged Mayo in front for the first time when he slotted over a close range mark ten minutes before the break. The 2017 footballer of the year then pushed Mayo two clear when he fisted the ball over on the run cutting in front the right. Mayo then had two great goal chances inside two minutes. The first fell to Brian Reape who got played in after Stephen Coen showed great bravery to flick the ball forward and take a heavy tackle in the process - but Reape’s effort was well saved by Morgan. Mayo didn’t leave empty handed though as Robert Hennelly split the uprights with the resulting 45 to put Mayo three points into the lead. Reape had another goal chance when Aidan O’Shea picked him on the run - but the Bohola Moy Davitts man’s effort off the deck wasn’t as clean as he would have liked and Morgan saved the ball easily. The Mayo supporters who made the long trip to Omagh didn’t have to wait too long for that goal to arrive - as four minutes before the break, Keith Higgins showed a clean pair of heels and a deft step to create the space inside the Tyrone cover, before he drove the ball to the back of the net from close range. McDonagh tagged on another point before the break to sent Mayo in leading 1-7 to 0-3 at the half-time whistle. Mayo kept the pressure up right from the off in the second half with McDonagh and Doherty both adding on points inside the opening five minutes. Tyrone did hit back through pointed McCurry mark on 42 minutes - but they were going to need something more if they were going to get back into this game - but it never looked like it would arrive for them. Conan Grugan did cut the gap back to seven points on the three quarter of an hour mark, but Mayo responded almost instantly through a Doherty point from close range. Mayo kept sticking to their game plan and it worked expertly as they kept pushing themselves that bit further and further in front as the clock moved on. The game was put beyond all doubt 58 minutes in when Aidan O’Shea picked out McDonagh on the run - the young Westport man still had plenty to do, but he trusted himself and cut towards goal and hit a shot that skipped past Morgan in the Tyrone goal and put Mayo 11 clear and looking forward to making the long bus trip home with two vital league points in the bag. Mayo: F McDonagh (1-3 ), J Doherty (0-3, 1f ), A Moran (0-2, 1m ), R Hennelly (0-2, 1 45, 1f ), C Tracey (0-2 ), P Durcan (0-1 ). Tyrone: P Harte (0-3, 1f ), L Brennan (0-2, 1m ), D McCurry (0-2, 1f, 1m ), N Morgan (0-1 ), M Donnelly (0-1, 1f ) C Grugan (0-1 ). Mayo: R Hennelly; S Coen, B Harrison, K Higgins; L Keegan, M Plunkett, P Durcan; D O'Connor, D Vaughan; F McDonagh, A O'Shea, C Tracey; B Reape, J Doherty, A Moran. Subs: C Diskin for Reape (49 ), J McCormack for Keegan (60 ), K McLoughlin for Moran (66 ), D Drake for Coen (69 ), M Ruane for Tracey (72 ).